Dryden's last three years of published works begin with Alexander's Feast and end with Fables, his largest miscellany of poetical translations. Alexander's Feast, like the earlier Song for St. Cecilia's Day (Works, III), was commissioned by the Musical Society for performance at its annual tribute to sacred music. The Fables included selections from Homer, Ovid, Boccaccio, and Chaucer. 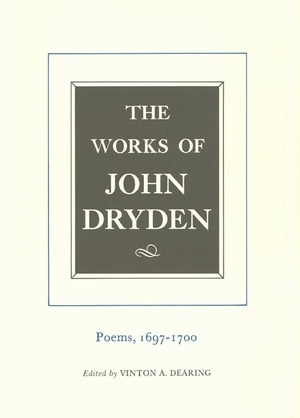 Extensive and detailed notes to these translations show readers how well Dryden succeeded in transmitting the styles and the very sounds of his originals. Volume VII ends with a section of miscellaneous pieces published at other times, including Dryden's only known Latin work. The presentation of the writings in this volume, like that of the entire twenty-volume series, is a tribute not only to Dryden but also to the editors who have guided it through five decades. John Dryden was an English poet, literary critic, translator, and playwright who was made England's first Poet Laureate in 1668. Vinton A. Dearing was Professor of English and Computer Applications in Literature at the University of California, Los Angeles.